The floor is covered in heaps of powdered sugar. Feet glide across this dessert heaven, meandering through beignet cloud nine. A whiff of the air tastes sweet with a hint of caffeine. It is a dreamland for anyone with a sweet tooth, myself included. Café Du Monde is not some undiscovered corner of New Orleans. Its popularity is evident by the heaps of powdered sugar covering its floor. And while I normally shy away from these places for the reality is they are often ruined in their very popularity, I was pleasantly surprised by this powdered sugary taste of New Orleans. New Orleans is a city of great food, po’boys, muffulettas and creole dishes just to name a few. For many, it can be hard to pick a favorite food in this city. After spending nearly a week in New Orleans, tasting dozens of dishes and food groups, the sweetest taste of the city for me comes from Café Du Monde down in the French Market. 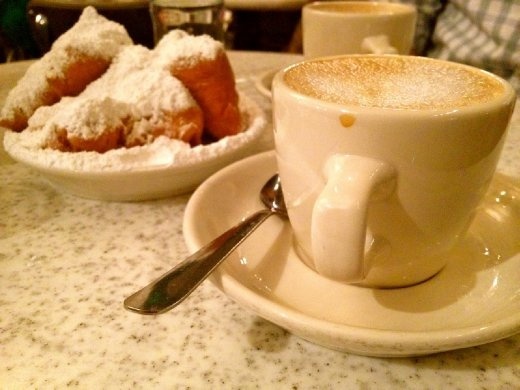 Founded in 1862, the Café has become synonymous with beignets and café au lait. I step under the café’s tent of cream and green stripe, eyes peeled for a table. 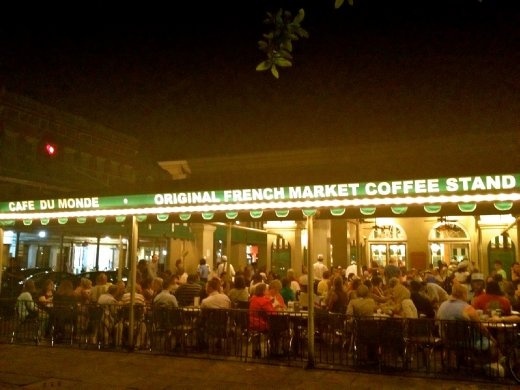 With the amount of people Café Du Monde serves, it is every man and woman for themselves when it comes to snagging a table. I secure my beignet eating and people watching perch for the evening. I don’t need to glance at the menu tacked to the napkin holder. You order beignets and café au lait here. 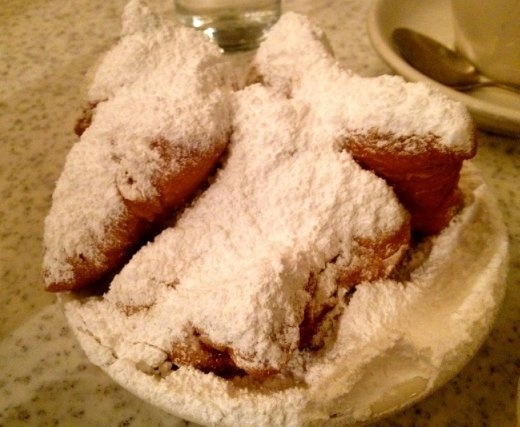 Café du Monde’s beignets come in a set of three, like most good things in life. The French style doughnuts are a comment on New Orleans’ very history. Founded as a French outpost in 1718, the city’s beignets offer one of the oldest tastes of New Orleans. The city’s founding brought settlers from France, Canada and Germany. The Acadians from Canada packed their gift for frying up dough into what would become the beignets I consume today. Anticipation consumes me as I wait for my trinity of beignets to appear on the marble tabletop. I watch in envy as neighboring tables have their first tastes. At last, my eyes turn away from envy and on to the beignets placed in front of me. Disguised under a mountain of powdered sugar, I instantly regret wearing a dark color to Café Du Monde. Clearly I am a beignet novice. Realising there is no way to prevent powdered sugar from covering me like the beignet in my hand, I go in for the kill. Sweet, a little chewy and the perfect amount of crisp, my first taste of a New Orleans beignet is one that has now spurred an addiction. Suddenly just three beignets don’t seem like enough. My eyes tell me this is far too much powdered sugar, while my taste buds say the opposite. You think it’s too much and yet it is just right. The beignets are fresh off of the fryer, unlike other world famous foods that go by way of mass production, losing their quality and meeting the microwave as their maker. For a fried doughnut to be good, it has to be prepared on the spot. There is no microwave involved in the preparation of my New Orleans dessert. To wash down the beignets, I sip on my café au lait, also Café Du Monde’s famous product. Mixed half and half with hot milk, the coffee has a chocolaty taste, thanks to the chicory within its liquid mixture. Chicory, the root of the endive plant, was added to coffee in New Orleans during the Civil War when supplies were scare. It cuts down the bitterness of dark coffee. A sip of café au lait from Café Du Monde is velvety, rich and the perfect compliment to a beignet. I check the hours for Café Du Monde, knowing this can’t be my first and last taste of beignets and café au lait while in New Orleans. Barring a hurricane or Christmas, Café Du Monde stays open 24 hours a day, 7 days a week. Yes, beignets are just that important. New Orleans can’t sleep without the dream and reality of having a beignet at 3AM.